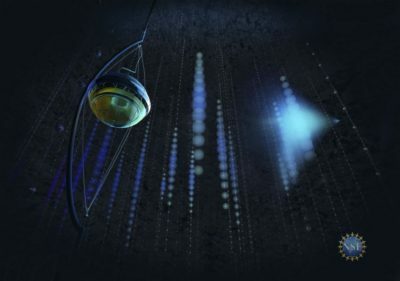 GRAND is a next-generation detector designed to collect ultra-high energy cosmic particles as cosmic rays, neutrinos and photons, in order to solve the long-standing mystery of their origin. It will consist in an array of 200,000 radio antennas deployed over 200,000 square kilometers, about the size of Great Britain, in favorable mountainous locations in the world. It will be the largest ground detector ever built. Our current focus is on the GRANDProto300 Phase. GRANDProto300 is a step towards the completion of GRAND. Already at this stage it will enable cosmic-ray studies at the "transition region", between 1016-18.5 eV. Click here to learn more about this standalone pathfinder! The GRAND white paper is now on arXiv. 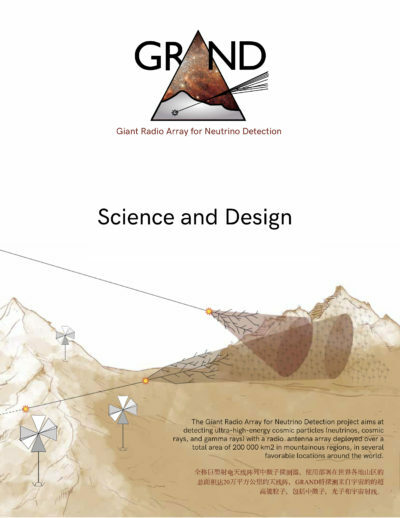 It describes GRAND's science goals, design, and construction plans, which are already ongoing. 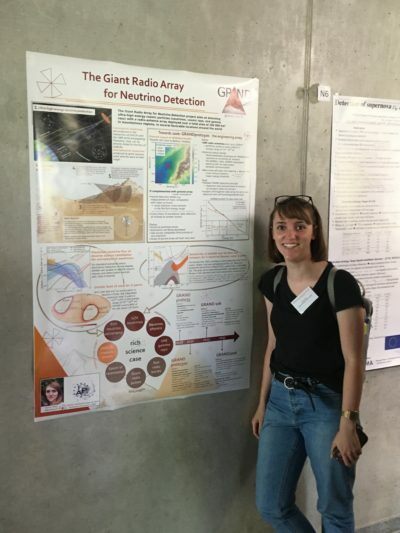 Anne Zilles (IAP), one of the pillars of the GRAND End-to-End simulation pipeline, presented a poster for GRAND at the Astroparticle Physics in Germany meeting, in Mainz, Germany. The coincident detection of the high-energy event (IC-170922A) on September 22, 2017 opens a new era of multi-messenger astronomy that include extremely high-energy neutrinos.